Whip up some mineral makeup at home! If the versions you've tried just aren't cutting it for you, you might want to learn how to make mineral makeup in the comfort of your own home. Many people choose to go this route for a variety of reasons. If wouldn't exactly call yourself a chemist, fortunately you don't need to be one to make your own makeup. At-home cosmetic creation is nothing new. It can be as simple as stirring some pigment into clear lip gloss and creating a whole new color. It can also be as complex and impressive as whipping up a batch of foundation. More and more people are discovering the benefits of creating their own cosmetics. Knowing what's actually in the products you apply to your skin everyday is a big deal, especially in this day and age when greater attention is paid to skin care. If cost is an issue, you can rest easy knowing the ingredients are inexpensive. 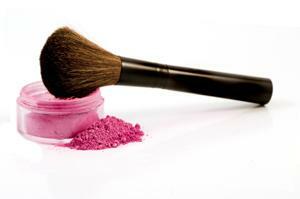 There are plenty of recipes for different shades and formulations of mineral makeup. They include everything from foundation and bronzer to eye shadow and blush. This is a quick and simple recipe that simply requires a good eye for color matching. One at a time, add the ingredients and blend thoroughly. The oxides control the color of your makeup, so add them slowly and one pinch at a time. It will allow you to keep a better eye on the color as it develops. Blend well for at least three minutes to allow proper ingredient dispersion. Similar to foundation, mix the ingredients together one at a time and blend thoroughly. The end result will be a shimmery tan bronzer. You can control the amount of shimmer by using a smaller amount of Arizona Sandstone (or none at all if you prefer a matte finish). Combine and mix the micronized titanium dioxide and magnesium stearate. Next, slowly stir in the iron oxide pigment and sericite mica and thoroughly mix with the pestle. Gently stir in the jojoba oil with a spoon. If the color is too dark for your liking, add more titanium dioxide or sericite mica in small amounts until it lightens to your desired shade. The color of the eye shadow can be adjusted by adding more iron oxide. Two teaspoons is an average starting point, but building on that amount will enrich the color further. As with the recipes for foundation and bronzer, add the ingredients one by one. Blend thoroughly and add the oxides in small amounts to achieve the best color for your skin tone. A drop or two of essential oil is optional in all mineral makeup recipes if you like a slight scent in your cosmetics. Replace the sericite ingredient with silica if you want a silky, soft powder that also helps diminish the appearance of fine lines. A mortar and pestle may suffice in the beginning, but you might end up graduating to a food processor. If that's the case, make sure it's used only for makeup! Keep notes of your personalized recipes and record the amounts of each ingredient used so you can recreate the color easily.